6/25 - 8/17, MON - FRI, AT 12PM. For 18 and under via the National School Lunch Program. Served outside when weather is nice, downstairs if not. EVERY MON. 10:30AM. CHILDREN’S ROOM. Stories, songs, and fingerplays, followed by a craft. Check Facebook to preview the theme each week! EVERY TUE. AT 10AM. YORK BRANCH. All the fun of story time, conveniently located at our branch in East Barre! THU. 8/2 FROM 3:30 - 4:30 PM. MILNE ROOM. Join us as we celebrate the end of our summer programs with a party and celebration. EVERY WED. AT 9:30-11AM. CHILDREN’S ROOM. This playgroup is for 0-3 year olds and their adults. Brought to you by the Family Center of Washington County. EVERY WED. 4PM. CHILDREN’S ROOM. Come test your creativity with LEGO challenges and earn badges. Legos and snacks provided. Ages 5 and up. Participate to get free earbuds, books, 3D print and a raffle ticket! Ask YA librarian for details. WED. 8/01 AT 1:30PM. YA ROOM. Watch anime and make candy sushi! TUE. 8/07 AT 1:30PM. YA ROOM. What can you make with fabrics? TUE. 8/14 AT 1:30PM. YA ROOM. Worried about summer ending soon? Make a stress ball! WED. 8/15 AT 1:30PM. YA ROOM. Movie and popcorn in the teen room! WED. 8/15 AT 6PM. MILNE RM. An epic fantasy novel that confronts prejudice and demonstrates the transformative power of education in her debut novel The Black Witch. Light refreshments and a signing follow the talk. SAT. 8/18 AT 1-5PM. YA ROOM. Sing and rock at this teen karaoke! Too shy to sing? Just come for the pizza and have some fun! Permission slip required. 7-12th graders, come voice your ideas and bring programs and events to the library! Ask the librarian how to join. EVERY FRI. 3-5PM. VERMONT ROOM. Magic players of all ages and experience levels are welcome to join the ongoing games. Earn a badge each week by taking on a challenge. For all ages. Teens, come game on our PS4! Also check out our Perler beads and board games. WED. 8/1 AT 1:30PM. MILNE ROOM. Enjoy the music of sax and piano with these two local musicians! “Carp” and Irene will play from their large repertoire of big band, jazz, and popular music. They have played together for more than 30 years. Don’t miss this memorable performance! WED. 8/1 AT 6PM. MILNE ROOM. Katherine Arden's bestselling novels, The Bear and the Nightingale and The Girl in the Tower (the first two volumes of a planned trilogy) are set in the almost endless winter of 14th-century Russia. In them, she masterfully blends traditional fairy tales with the gorgeously told coming-of-age story of fierce young protagonist Vasya. Light refreshments and a signing follow the talk. Books available for sale thanks to Next Chapter Bookstore. TUE. 8/21 AT 6:30PM. BOARD ROOM. This month’s selection is Crime and Punishment. Copies available at the library. Note: the book group meets on Tuesdays from June-August to allow members to attend the Summer Authors series on Wednesday evenings. TUE. 7/24 AT 6:30PM. BOARD ROOM. Show your library love by joining the Friends! All funds raised by the Friends of the Library support collections and programs. EVERY THU. 1-3PM. VERMONT ROOM. Fiber artists of all sorts, ages, and abilities are welcome. Give and get advice and inspiration with a great group of crafters! Spin, weave, knit, crochet and more! WED. 8/8 AT 6PM. MILNE ROOM. William Alexander won the National Book Award for Young People's Literature for his 2012 work Goblin Secrets. His latest book, A Properly Unhaunted Place, follows the story of two kids who try to save their small town by bringing back its ghosts. Will also teaches writing at the Vermont College of Fine Arts. Light refreshments and a signing follow the talk. Books available for sale thanks to Next Chapter Bookstore. WED. 8/15 AT 6PM. MILNE ROOM. Laurie Forest uses the lens of epic fantasy to confront prejudice and demonstrate the transformative power of education in her debut novel The Black Witch. What started as a fun writing side project turned into a three-book deal with a major publisher, complete with a national tour, translations into five languages, and an amazing adventure into the world of publishing. Light refreshments and a signing follow the talk. Books available for sale thanks to Next Chapter Bookstore. THU. 8/23 AT 6:30PM. YORK BRANCH. Matthew Polk, classical guitarist and strings educator, and the Polk Sisters will share a diverse collection of string music, including mariachi, classical, and Spanish guitar. Featuring violins, bass, cello and guitar. Meet award winning Jersey dairy cows, draft horses and sheep, explore the carefully restored 1890 Farm House, sample Billings Farm cheddar, and taking part in hands-on activities. Time for a field trip! 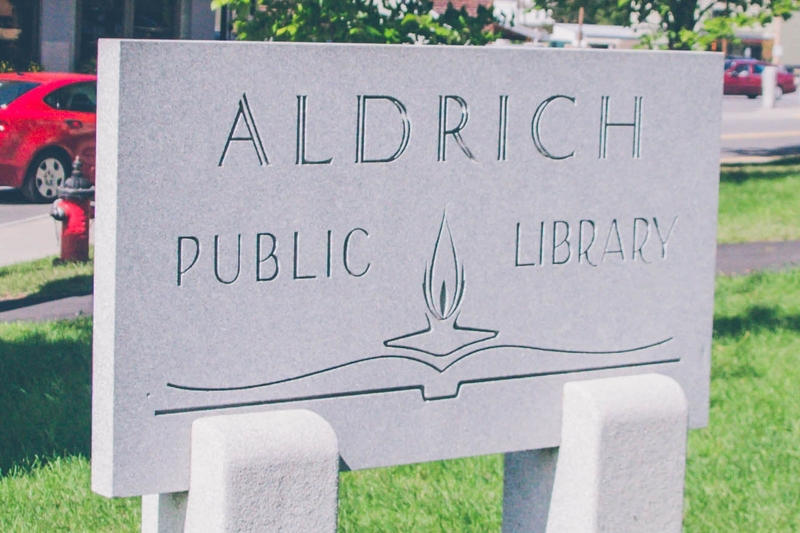 Family passes available at the Aldrich Library in the Katherine Paterson children’s room. Hajime Isayama's hit graphic novel series, Attack on Titan, is a gruesome look at humanity's survival when humans are no longer at the top of the food chain. Discover how our protagonists break through our gilded cage and learn to fight not only the threats beyond the walls, but the threats lurking in the shadows on the inside.. The newest season of the adapted animated series just aired, so now is a great time to catch up on the original, ongoing graphic novels! The rough art style helps convey a sense of grittiness, the characters give you hope, and the world building becomes more mysterious and intriguing as the plot progresses.